The Most Rev. 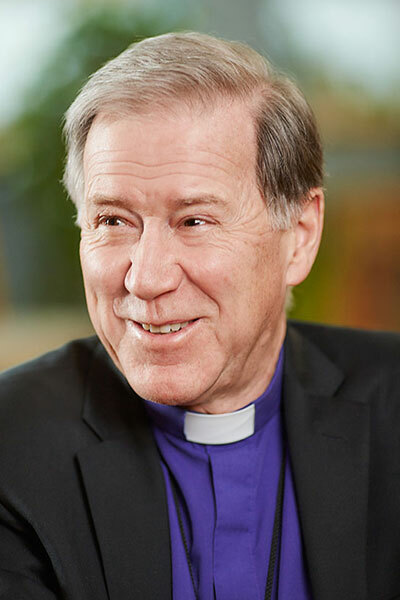 Fred Hiltz was born in Dartmouth, Nova Scotia and served in a number of parishes within the Diocese of Nova Scotia and Prince Edward Island. He was elected Suffragan Bishop of the Diocese in 1994 and diocesan bishop in 2002. General Synod elected him as the 13th Primate in 2007. He travels extensively from ‘Coast to Coast to Coast’ and is recognized throughout Canada by “our beloved Church” for his work in reconciliation and self-determination by our Indigenous Communities. Archbishop Fred was the first Primate to be elected President of the Board of Directors of the Primate’s World Relief and Development Fund (PWRDF). He serves as the liaison bishop to Mission to Seafarers Canada and chairs the Board of Directors of the Anglican Foundation of Canada. Fred and his wife Lynne Samways-Hiltz enjoy caring for animals, especially for their cat Mr. Tim. Their son Nathan is married to Melissa and they have one daughter Leah.